The Teclast F7 is a 14-inch notebook from China with a full HD display, an Intel N3450 CPU. How good can this cheap notebook be? Read my review to find out. The Teclast F7 is a 14-inch notebook from China that costs around 300 US Dollars. 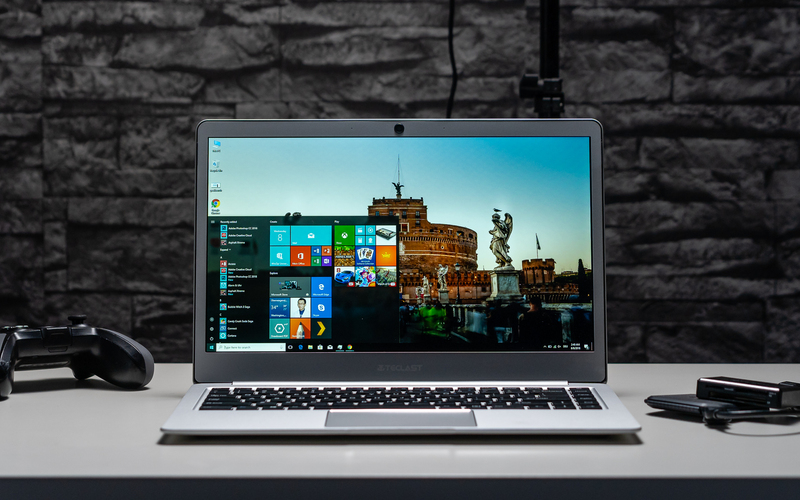 Even though it is quite inexpensive, it features a full HD display, an Intel Celeron N3450 Apollo Lake chipset, 6GB of RAM and a 64GB to 128GB internal storage. Other specs include an SSD expansion slot. I’ve been using it for over a month now and this is my Teclast F7 review. As I said, the Teclast F7 is a notebook from China. That means you usually can’t buy it at your local store. Instead, you probably have to import it from shops like GearBest. They are the ones who send me this review unit too. You get get it right here*. Even though the Teclast F7 is so inexpensive, it offers a mostly metal body. Its design is similar to the Teclast F6 Pro which is a convertible that I reviewed already. Well, as I said, it features a mostly metal body. The bezels around the screen are made of plastic only. Thanks to its metal build the Teclast F7 looks nice and does not feel super cheap. However, it does not feel super high-end either. With 1.35 centimeters it is thin enough and the weight is alright too with 1.23 kilograms. There are lighter notebooks out there but they are much more expensive. On the right side, we get a connector for the power plug, a standard headphone jack, a USB 3.0 port and a microSD card slot. On the left side, there is another USB 3.0 port and an HDMI out. Yes, sadly there is no USB C port and I would have loved to see a full-size SD card slot. I don’t understand why we get microSD slots on 14-inch notebooks these days. Anyways. One major highlight is the SSD expansion slot on the back of the Teclast F7. You just have to open one screw to expand the storage with your own SSD. Or, if you have the 128GB SSD version, you can exchange it easily. Let’s take a look at the keyboard. It is a standard chicklet-style keyboard and certainly one of the better ones in devices like these. It offers big enough shift keys and the arrow keys are not squished together, that’s great. Compared to my much pricier notebook the keys feel a bit soft when typing, but overall, it’s a great keyboard. I was able to write long articles immediately without having to get used to it. The keyboard has a standard US layout and Teclast does not offer other ones. So, if you are from countries like Germany or Spain and are not used to a US keyboard, it might take you some time to get used to it. However, you can always change the keyboard layout in Windows and then all special characters are at the same place as on your local keyboard. Like on all notebooks, we get a touchpad underneath the keyboard. The trackpad is not the biggest but certainly big enough. And, according to Windows, it is a precision touchpad. That seems to be the case indeed because all multitouch gestures work just like they should. Overall, it is a good touchpad that works just fine. The Teclast F7 has two speakers that are placed between the hinge and the screen. As you might expect at this price point, the sound quality is far from outstanding. But, it is not too bad either. While you won’t be able to fill a big room when watching Netflix, it is certainly fine to watch some YouTube with it. Well, you don’t get a big bass but that’s to be expected with a notebook like this. I’ve got similar things to say about the webcam. It is placed above the screen and has a resolution of 2 megapixels. While you can record HD videos, the quality is not that great. I guess it is fine for some skype calls but its far from good. The Teclast F7 features a 14-inch display with an aspect ratio of 16:9 and a full HD resolution of 1920 x 1080. Considering its price, the display is quite good. The resolution is high enough and texts and icons look sharp. And it is an IPS panel with wide viewing angles. We don’t see that too often at this price point. However, it is a bit disappointing that we are getting a glossy display. Yes, it has some advantages. For example, colors look more saturated and the contrast is higher. But it has some downsides too because it converts the screen into a mirror in direct sunlight. Well, it’s not even bright enough for direct sunlight. You will be able to work with it in the shadows but don’t expect to use the Teclast F7 at the beach. The screen is just too dark for that. There is another issue that I did not notice until I started to shoot this video: The display has a greenish-blue color cast. Actually, it is not too bad in real life. As I said, I didn’t notice it until I started to make this video. That is because the camera exaggerates the color cast quite a lot. It certainly is there, but it’s really not as bad in real life as it looks on camera. However, if you are a professional photographer and a calibrated screen is critical for your work, you obviously shouldn’t get this. So, overall, I think the Teclast F7 has a good screen. Especially considering its price. Yes, it could be brighter and it has a slight color cast. But at under 300 Dollars, it is quite rare to see a 14-inch IPS display with a full HD resolution. Inside the Teclast F7 runs an Intel Celeron N3450 Apollo Lake chipset. It is a quad-core processor with all four cores clocked at 1.1GHz. They can go up to 2.4GHz in Turbo-Boost. We’ve seen this chip in tablets like the Chuwi SurBook Mini (review) already. While it is not as fast a Core m3, it certainly is much more powerful than those Intel Atom chips we’ve seen for years. Another highlight is that we don’t just get 4GB but 6GB of RAM. Most devices in this price range offer 4GB only. You can get the Teclast F7 in two versions. One is shipped with a 64GB eMMC storage and the other one features a 128GB SSD. That is a bigger but also faster type of storage. Both have the SSD expansion slot on the back. Other features include WIFI ac and Bluetooth 4.2. Teclast is not offering an LTE version. Well, how good is the performance of the Teclast F7? Let me say one thing first: If you are looking for a gaming notebook or want to edit 4K video, then this is certainly not the one to get. You have to spend more money on that. Instead, this is meant for office work. Or to watch some YouTube or Netflix or for surfing the web. The performance is certainly fine for that. In fact, the Intel N3450 is together with the 6GB of RAM fast enough to do some light multitasking. I always used the browser and Microsoft Word at the same time and it works great. The performance is good enough for some light photoshop work too. It certainly is possible to edit some pictures with this. However, obviously, a more powerful machine is better if you are working on huge photoshop files. Actually, quite a lot is possible with a notebook like this. It’s even possible to edit full HD videos in programs like PowerDirector. While all of that is possible, you also shouldn’t expect too much. Again, this is a 300 dollar machine and you can’t compare it to a 1000 dollar ultrabook. That is what my benchmark tests show as well. As you can see in my comparison chart, the performance is much better than on devices with an Intel Atom x5. The Atom x5 is the chip we’ve seen in up to 500-dollar Windows tablets just a couple of years ago. But, as you can see as well, chips like a Core m3 or Core i5 are much faster too. Another thing that is quite interesting: Considering the Teclast F7 features an Intel N3450, the benchmark results are really good. I think that is due to the 6GB of RAM. As I said earlier, most competitors offer 4GB only. Well, this is not a gaming notebook. But you can play some less demanding games on here like Asphalt Xtreme. But more demanding games like Fortnite do not run smoothly. The Teclast F7 features a battery with a capacity of 4900mAh. In my standard battery test, that lasted for a runtime of 4 hours. I’m always looping an HD video at 50 percent brightness for this test. Now, that is my standard test. How long it lasts during real-life use always depends on what you are doing. Typically, I was able to work with it for 3.5 to 5 hours while mostly using Chrome and Word. Both results are pretty bad. However, there might be something wrong with the battery of my review unit. According to other reviewers, the battery can last up to 6, according to some even up to 8 hours. Now, I ran my battery test four times and I always got those 4 hours. Alright, should you buy the Teclast F7? Well, considering its price of around 300 US Dollars I think its performance is pretty good. At the same time, we get a nice metal body and an SSD expansion slot. I also like that it features a 14-inch IPS display with wide viewing angles and a full HD resolution. However, the screen could be brighter. And, at least with my review unit, the battery life is pretty bad. So, I can recommend the Teclast F7 if you are looking for a cheap notebook to do some office work or web browsing. But if you are working outside a lot the screen is not bright enough and the battery life too short. Oh well, you always have to consider the price. At around 300 Dollars it is really cheap. Overall, I think the value is pretty good here.